What are those pencil billboards in the Jewelry District? 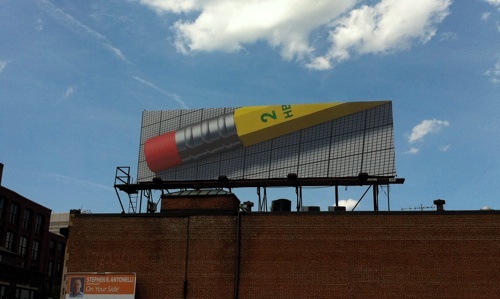 Have you seen the billboards in the Jewelry District with the giant pencils on them? Wondering what they were all about? Well go here to find out all about them. I think maybe I don’t get art. Did you go to the link and see the photo of the two billboards lined up? That’s pretty damn slick I think. That’s a very nice little project…I wish they had a more direct way to link the explanation to the installation itself. Cute, but the point of it will be lost on 99.9% of people. Yeah, I saw the way they line up, and it is indeed cool, but if I saw it I would think “Oh, are they opening a new Staples?”.